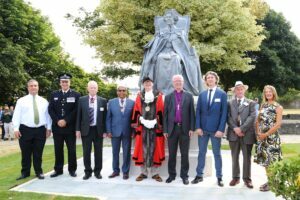 Left to Right: Cllr John Burden, Chief Constable Andy Gadd, Honorary Freeman of The Borough and Leader of Gravesham Borough Councillor Cllr David Turner, Deputy Lieutenant Dr Bhargawa Vasudaven, Mayor of Gravesham Cllr David Hurley, Rt Rev James Langstaff, Bishop of Rochester and Bishop to H.M. Prisons, Sculptor Douglas Jennings MRBS, David Hughes Chief Executive GBC, Sue Lord Service Manager for Major Regeneration Projects. © Sarah Knight. On 26th July at St Andrew’s Gardens in Gravesend, Councillor David Turner, as the Leader of Gravesham Borough Council and Freeman of the Borough, along with Rt Rev James Longstaff, Bishop of Rochester and Bishop of HM Prisons, unveiled a statue of Her Majesty Queen Elizabeth II in commemoration of her being the longest reigning monarch. Dr Bhargawa Vasudaven DL was present as the representative of the Lieutenancy of Kent, and also in attendance were various community and council leaders, senior representatives from the Fire Service, Police, Port of London Authority and various local voluntary organisations. Her Majesty’s unifying force, not only in the Commonwealth but globally – appreciating others’ contributions and encouraging diversity.